In the northern hemisphere, and in the last few months of the year, the temperature gets colder. In early autumn mornings, the outside air temperature can actually be cooler than the temperature of the water in this pond, and in most ponds in the northern hemisphere. Cooler air temperature, and a warmer water temperature — its like having a boiling caldera exposed to the noontime sun. It simmers. 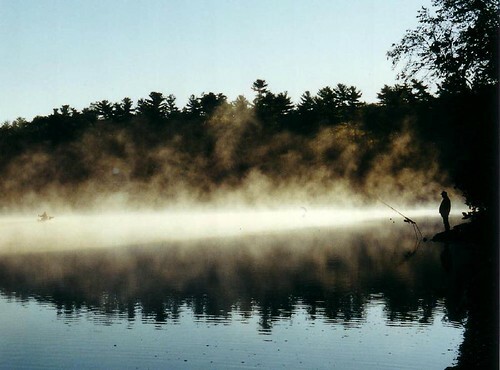 Photo taken shortly before sunrise at Walden Pond. Walden Pond is said to be formed by Glaciers retreating to the northern hemisphere, a few thousand years ago. Henry David Thoreau, one the well known American writers and philosopher lived on the shores of this pond in the mid 1800s. 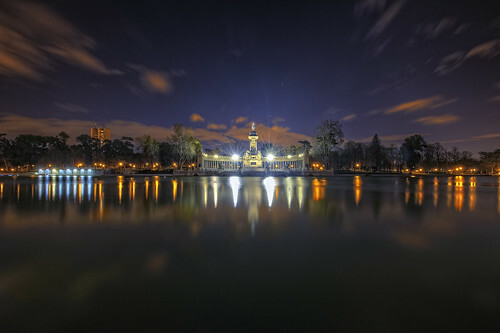 Close to the northern entrance of the park is the Estanque del Retiro ("Retiro Pond"), a large artificial pond. Next to it is the monument to King Alfonso XII, featuring a semicircular colonnade and an equestrian statue of the monarch on the top of a tall central core (Wikipedia). HDR from five bracketed exposures (1EV step) on a tripod. En 1902 se convocó un concurso nacional para construir un monumento al rey Alfonso XII, a iniciativa de la reina madre doña María Cristina. El ganador fue el arquitecto José Grasés Riera con un grandioso proyecto en uno de los lados mayores del Estanque del Retiro compuesto por una gran columnata con un gran número de esculturas que rodearía a la estatua ecuestre del rey, a un lado del estanque (Wikipedia). HDR generado a partir de un horquillado de cinco exposiciones (paso de 1EV) con trípode.